The Zen of Winter Shepherding seems to be another “stay in the moment” imperative: do not let the weather forecast fake you out. Of course, you need good gear in order to not be afraid of what the elements could throw at you. Mostly, though, it’s a good idea to remember the future is, ultimately, unknowable. So best to stride bravely out and cope with what comes. I’ve missed a couple of really lovely days because I believed the forecast, then got hit with a couple of awful ones when the slow-moving system hit the next day. Don’t get me wrong, I think the Australian Weather Bureau does a fantastic job, especially for the challenge of Tasmania, where weather patterns shift on the time scale of moments and hours. It’s a standing joke here you don’t need a year to experience all four seasons—you can have them all in the same day. I just think it’s important not to let the forecast deter me from shepherding. Why am I shepherding in winter? I hadn’t planned to, but the ongoing lack of soil moisture and pasture growth, combined with an unseasonably cold May (we were all hoping for a spurt of growth which never occurred), means forage is quite tight to get the flock through to September, when what passes for Spring in Tasmania will provide us with real growth. 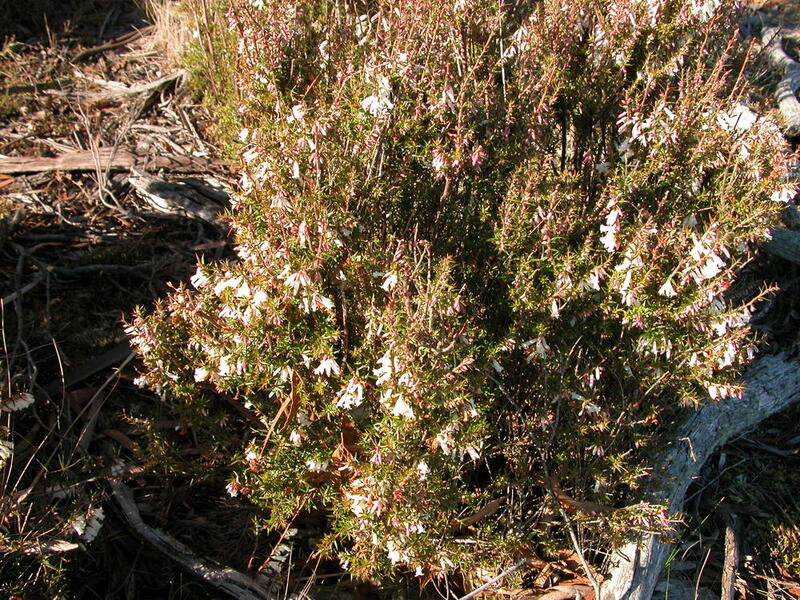 A lovely June surprise–a patch of peachberry heath in full bloom! So, to stretch the available forage as far as possible, I’m using my shepherding skills to convince the sheep to eat in all of the corners of the property, and to look on gorse, she-oak, briar rose and even horehound as tasty adjuncts to their grass and broad-leaf plant graze. The flock exploring a nearly inaccessible corner of one of the reserves, and making good inroads on the gorse. 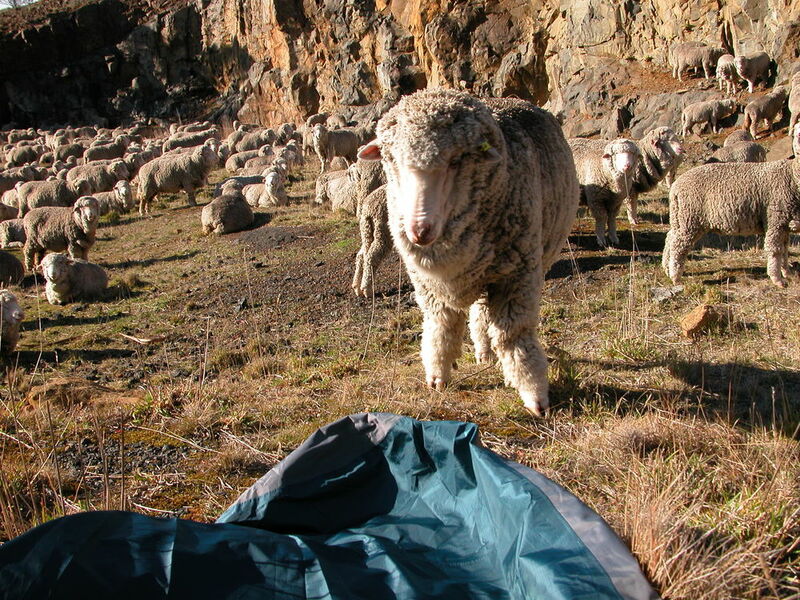 While the sheep are cosy in their 2+ inches of fleece, the snowstorms in May convinced me that my own gear was sadly insufficient to deal with a true Tasmanian winter. The main challenge for me is staying warm and dry while sitting and waiting for the sheep to ruminate. I’d been using a makeshift combination of things I had on hand—a tiny groundsheet no longer waterproof, a scrap of closed-cell foam to insulate me from the ground, and an old cashmere shawl over my legs to keep me warm. It might have worked, but none of it would stay in place, and I just couldn’t keep the drafts out. Chance guarding the “bivy bag” and the new thermal pad. We’re hunkered down in the quarry, trying to stay out of the westerly gale. Here’s my new high tech solution, something called a “bivy (for bivouac) bag”: waterproof, windproof, and with a single pole to hold the top away from my head while I’m snugly zipped up inside. It is brilliant. So far, I’ve managed to nap through a rainstorm and two windstorms while the sheep were resting. Prince, one of Vicky’s friends, eyeing off the weird new gear. Ironically, though, the grazing patterns of the sheep have altered significantly with the onset of winter. They don’t rest/ruminate as often during the day, and when they do, it is for a shorter time. On a cold, windy, cloudy day (in short, one where I would be happy for a long sojourn in my bivy bag at noon), they often don’t stop at all. 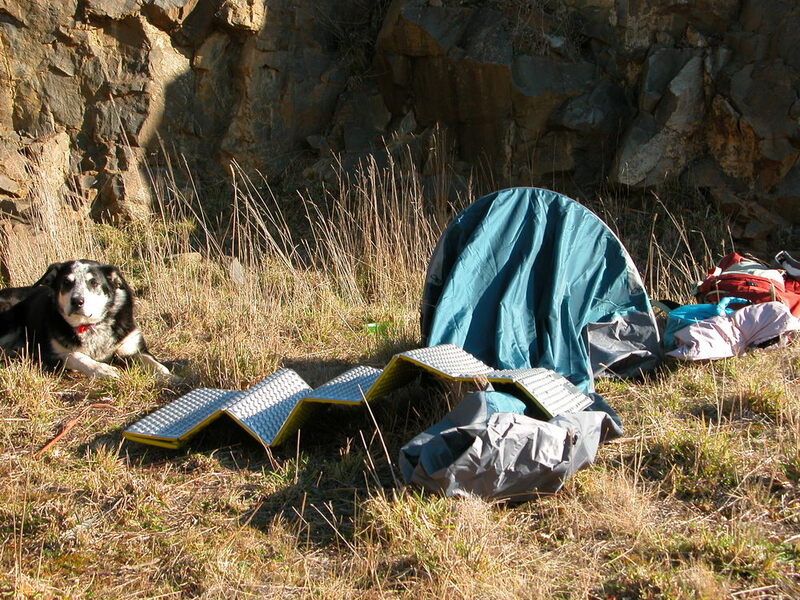 Whereas on a nice sunny day, when I don’t really need the bivy, they are happy to stop for an hour or more. Fred Provenza (my livestock nutrition mentor) tells me metabolism slows down in winter, allowing the animals to make use of the poorer quality forage resulting from slow or no growth. It presumably takes the animals longer to feel satiated—and hence ready to ruminate—on the coarser grasses. Grazing across a hillside of predominantly native grasses, coarse and fairly dry, but still popular. To help cope with the much shorter daylight hours, I am now starting the flock into the day’s grazing as early as I can manage, allowing them to graze freely for the first 3 hours while I go and finish my morning chores and have breakfast (I’m about to head off right now, as it is just getting light at 7). I then go and find the flock, taking them for the rest of the day’s circuit, and finishing off at about 3:30, so I can get home in time to run the dogs, make the dog food, and get in to the nice warm house by dark. I’m pleased to report that the shepherding itself is getting easier and more fun as I get better at my job, which is really to figure out what the sheep want to do, and how it fits most easily with what I think is needed—for the sheep and the landscape. 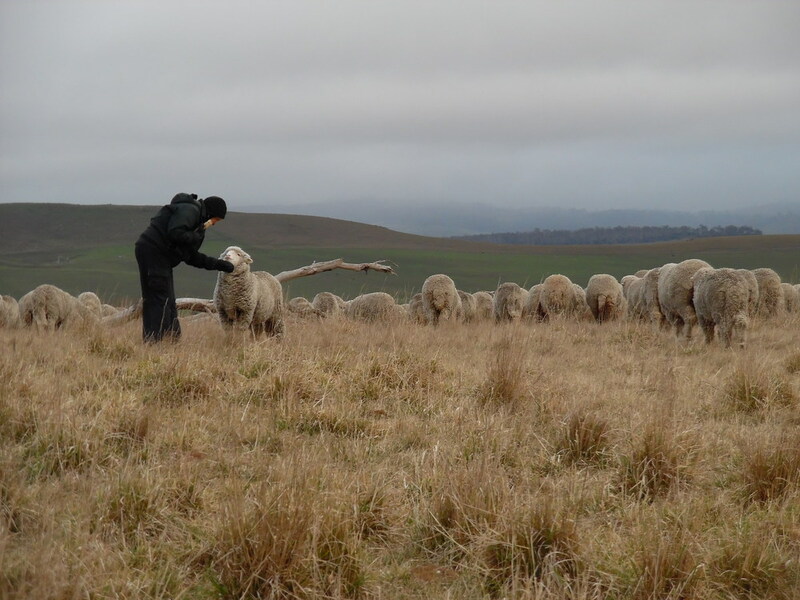 For instance, the other day I went out with plan A—the first note—and realised as soon as I saw the sheep they were responding to a combination of the wind direction and a fresh paddock (upwind). So we took a 180-degree turn and had a really wonderful, easy graze--better than plan A, all the way around. Lyn Heenan holding the boundary line as the flock grazes a very thick stand of cocksfoot. I’m heading off on my trip to Bendigo and then to New Zealand to visit Design Spun, this coming week, and will be gone until the 30th of July. Lyn Heenan, my farm/dog/cat/house/sheep-sitter, has been here since July 1st , in fairly intensive training. She and I both feel she’s ready to fly solo. She’ll also be dealing with emails and the website, leaving me free to just enjoy my trip. Also, welcome to all the new subscribers this month, many of whom came to the website via a review of the boucle yarn by Knitter’s Review.